My day started with a trot through the light dusting of snow that had settled on Whittlesford, delivering my newsletter and chatting to the few people who were up and about. That included a hardy family living along Hill Farm Road. Despite being little more than a lane, this road has a national speed limit for most of its length, and the 30mph speed limit only kicks in where the houses start. We talked road safety and how it needs some attention, now that Duxford Road has secured its chicanes. I was looking forward to heading over to Thriplow for the Daffodil Weekend, but dismayed at the weather prospects. Before I could get over there though there was this business of a return of the travellers to the field next to the Pet Crem along the A505 at Thriplow Heath. This field has been a constant issue, and there is a high court injunction on it preventing trespass that I helped the district council secure way back in 2009. The owners put in a feeble trench a few weeks back but residents reported a digger being offloaded from a vehicle this morning, onto the A505 (with the traffic being held up on this busy road in the meanwhile!) and used to fill in the trench so the caravans could get access to the field. I called the police and the county enforcement team this morning. By about 1.30 today the twenty or so caravans and assorted trucks, trailers and vans had moved off the site, heading we don't know where, but doubtless they will be back. 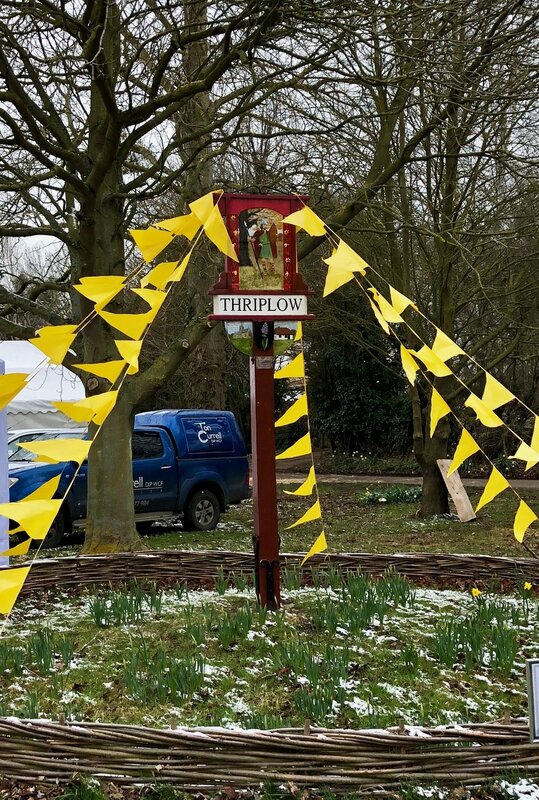 There were far fewer people about in Thriplow because of the cold, even though the standard of what was on offer was again really high, with the new Country Thriplow selection, opposite where all the foodie tents were. The morris dancers were keeping warm, and the Green Man was full (unsurprisingly). We had a steaming paella, some pulled pork, and chocolate brownies to keep the carbs on and the cold out.